Here we are in 2019 still discussing the possibility of an historical King Arthur. How and why that is the case is a fascinating story told expertly by the historian Nicholas J. Higham in King Arthur: The Making of a Legend, published last year by Yale University Press. The sad and unromantic takeaway message of the book is that there was no historical Arthur. Higham writes in conclusion: “…the question whether or not Arthur can reasonably be allowed a role in history can only elicit a negative response.” (Higham, 275) The case is made against all-comers: fantasists and myth-makers, old and new; speculative theorists; agnostic academics and many more. In a previous post (“Worlds of Arthur: Reflections on the Fictional World of post-Roman Britain”), I wrote that “Arthur is as small in history as he is large in the imagination.” Against this, Higham would write that Arthur is invisible to history, or if not absolutely invisible then a tiny Tom Thumb who somehow grew to become a giant of the mind. A curious thing among many curiosities associated with Arthur is that his career as a figure of history has enjoyed such a long and vital life, thriving today on bookshop shelves the world over. Primarily, this account of Arthur was as a war-leader of the Britons fighting against the invading Saxons sometime in the 5th and 6th centuries. For the making of that story, two key medieval texts stand out. Historia Brittonum has been mentioned already, a work from the 9th century, written in North Wales by a scribe who is known to us as Nennius. The second text is of course Geoffrey of Monmouth’s The History of the Kings of Britain from 1136, which led to the emergence of Arthur as a hero of the Middle Ages, beyond the Celtic fringe of western Europe, soon to be taken up by continental authors as a model of chivalry. Connecting such prophetic utterances to the political exigencies of the day, Thomas comments that the Reformation and the Civil War were in England periods when “prophecies were most prominent,” – his argument being that such periods tend to occur at times of “rebellion, discontent and violent change…” (Thomas, 505) He further argues that “All societies seek to establish links with their own past, to display the ‘founding charter’ which explains and justifies their own existence.” (Thomas, 505) For a time at least, therefore, Arthur was transformed into a central player in the mythology of English and British statehood. 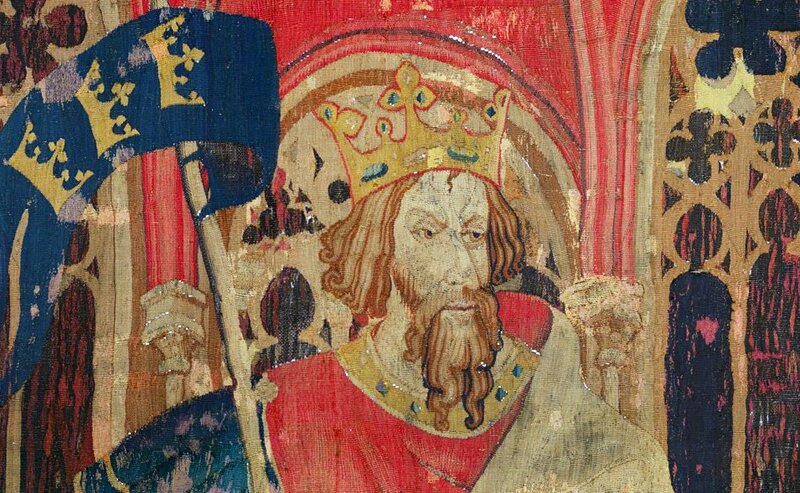 King Arthur depicted in the 14th century Chronicle of England by Peter de Langtoft. In Nennius we find an heroic past, encapsulated in the 12 battles fought by Arthur, alongside tales of ongoing struggle between a red worm (the British) against a white worm (the Anglo-Saxons), where the dour present is contrasted with a glorious future in which the red triumphs over the white. The Kingdom of Gwynedd was rich ground for the making of prophecy, with a new King originating from the Isle of Man coming to the throne, seeking to establish his “founding charter” and with it the basis of his legitimacy. This was at a time of violent change, when the Welsh, the people who still called themselves Britons, whose political primacy over the island was lost for all practical purposes, sought to establish a defining heroic narrative of British resistance to foreign invasion. To this end, Nennius and the scholarly community to which he belonged in Abergele in North Wales manipulated the distant past to serve the political needs of the present. (Higham, 206-7) That is Higham’s argument. In any event, we have in Higham’s book an account of the Historia Brittonum which places it within the political context of its day. Of course, Higham covers much more ground than this. The evidence for every version of Arthur – from unlikely “Dalmation”, Sarmation and Greek Arthurs, to the British Arthurs of Celtic mythology or “dark age” history – is analysed and weighed, only for them all to be found wanting historical truth. But it is the Historia Brittonum where it all starts and it is to its lack of verifiable source material closer to the events it purports to describe that Higham looks. Notably, there is no mention of Arthur in the only relevant British source dating from the 6th century – Gildas’s De Excidio Britanniae. A feature of Higham’s analysis is the influence of the Old Testament on both Nennius and Gildas, with both viewing British history through this lens. (Higham, 183) In the case of Gildas, his polemical purpose was served by a highly negative account of the British and their sins. Whereas, Nennius’s polemical purposes were met by a more positive account, one that was achieved with assistance from Arthur it must be said, all of it fictional Higham maintains. Secondly, and more obviously, there is no chance that Higham’s unpicking of all the sources for an historical Arthur will in any way dissuade modern-day authors, novelists and others, from finding Arthur, the idea or the purported reality, in all manner of places. I include myself among those who find the story too beguiling to leave completely alone. The uses and abuses of King Arthur are destined to continue.